Join us on Saturday, June 23, 2018 for a FREE festival for all ages to celebrate the opening of the Art Museum’s summer exhibit, Making Waves | A Drew Brophy Retrospective. 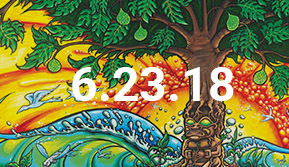 Featuring: live music by Paperwork, surf art workshops, Drew Brophy inspired community mural, food truck, yoga, massages, exhibit tours led by Drew Brophy, surf and art vendors, henna tattos, surf film screenings and more! For more information, please call the Art Museum at 843.238.2510 and stay connected with us on social media and our website.